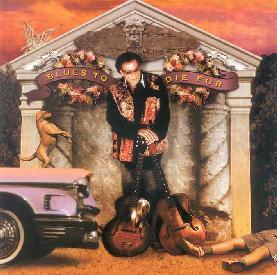 Leslie West - "Blues To Die For"
Leslie West, needs no introduction. The man provided monster guitar riffs and vocals back in the late 60’s and early 70’s with MOUNTAIN. Mountain had a reunion last year but I guess these are songs that Leslie had in his bag. He is backed by Ansley Dunbar on drums and Gunter Nezhoda on bass, Kevin Curry on rhythm guitar and a few guests on Hammond organ. I was quite skeptical about this release as I had one of Leslie’s blues releases from some years back and it really did not capture my attention and it seemed so uninspired. The CD begins with "Crawlin Kingsnake" and features some nice slide guitar. The production is clean but a bit rougher than some of his previous blues CDs. "Boom Boom", an original, is next and it has a great foot stomping riff but really lame lyrics. "Mean Mistreater" (Muddy Waters) and "I’m Ready" (Willie Dixon) are treated to excellent renditions. "Talk To Your Daughter" is another serious slide guitar outing. Leslie can still play the guitar for sure but the original songs are quite lacking. The covers are by far the best songs on the CD with additional renditions of "Don’t Start Me Talkin’" (not as good as the Rory Gallagher version) and "Born Under A Bad Sign". A pretty enjoyable CD and glad to hear one of the great guitar players of the heavy 70’s period can still rip it up. For more information you can visit the Leslie West web site at: http://mountaintheband.com.